The Wings had just snapped a seven-game losing streak with an outstanding 5-1 victory over the strong Winnipeg Jets. Detroit had a great first power play, sustaining pressure in the offensive zone for the entirety of the two minutes. The Blues struck first on their fourth shot of the game immediately after, as Jaden Schwartz temporarily took over the team lead in points with 35. Jaden Schwartz of the St.
Louis Blues scores the first goal of the game. Toward the end of the period, Schwartz absorbed a shot in the neutral zone around his ankle/shin and needed to be helped off the ice after being unable to stand up on his own. 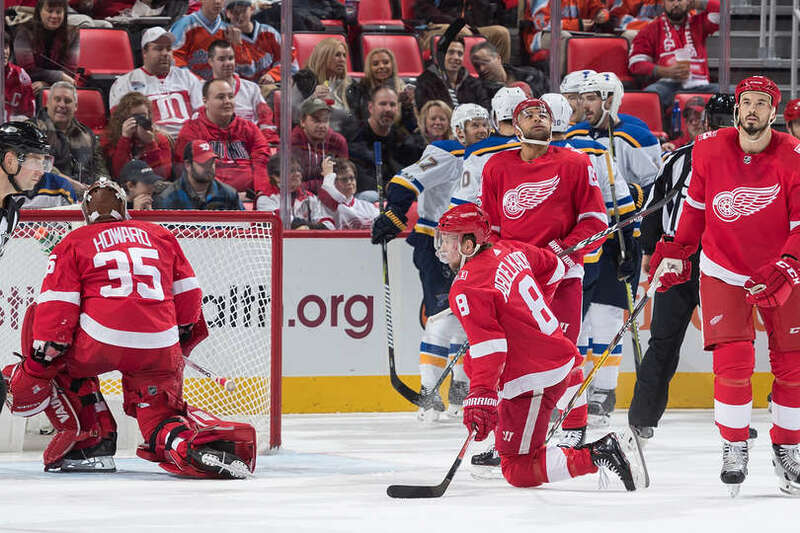 Vladimir Sobotka, in his first full season back in the NHL, made it 2-0 4:07 into the middle frame, beating goalie Jimmy Howard over the far-side shoulder. Two goals on five shots. Then, Scottie Upshall scored on a breakaway opportunity, sliding the puck through the five-hole as Howard slid across the crease. Three goals on six shots. Next, defenseman Jay Bouwmeester scored his first goal of the season, with help from Alex Pietrangelo. Four goals on eight shots. Finally, the embarrassment ended, as Detroit still led 20-10 in shots at the end of the second. Goalies usually like to see more shots, as it keeps them more involved in the play, and this likely no exception. “They’re extremely tough,” said Howard of such games. “When they finally do get an opportunity, usually it’s a good one, and you got to be called upon to make the save, and I wasn’t able to do that for the guys tonight. To begin the third, a net-front scramble ended with a goal for center Frans Nielsen, who put the Red Wings on the board. He was having a very sub-par game, and he nearly missed the easy empty-net goal near the crease, as he just managed to catch the puck with the tip of his stick. Petr Mrazek came into the third in relief of Howard, and he allowed a goal near the midway mark. Blues forward Dmitrij Jaskin caught a long pass, breaking forward toward the Wings’ blue line. Detroit defensemen Jonathan Ericsson and Trevor Daley did not pick up on the play and let him in all alone on a breakaway. Jaskin scored backhand-forehand on Mrazek. With 41 seconds left, Brayden Schenn scored, assisted by Tarasenko, to reach the final score of 6-1. Coach Jeff Blashill defended Jimmy Howard, amid an onslaught of sarcastic cheers when he made a couple easy saves in the third period. He says he’s not worried about the veteran netminder, and that he continues to do a lot of things right. As it stands, most of the blame should rightfully fall upon the defense, as the combined blueline goal total is 5 (worst in the league), while St. Louis now has 23 goals by defensemen (best in the league). Games generally aren’t won or lost based solely on defensive production, but back-end scoring is a necessity on any team. Detroit currently only has one player who can shoot and pass the puck well, and that’s Mike Green. Tyler Bertuzzi made his long-awaited season debut, logging about ten minutes of ice time. An injury prevented him from starting the season in Detroit. Blashill would not say how long this stint would last, noting that Luke Witkowski’s upcoming suspension conclusion may impact the decision.